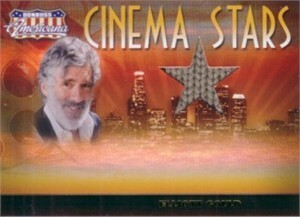 Donruss Americana Cinema Stars insert card CS-6 of actor Elliott Gould (starred as Trapper John on M*A*S*H) with a swatch of sweater he actually wore. #176 of only 500 cards produced. ONLY ONE AVAILABLE FOR SALE.